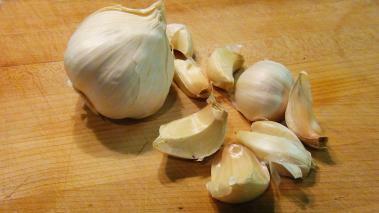 I use garlic pretty frequently, and chances are you do to. And given how much we use garlic, it pays to get good at prepping it…breaking up the blubs, removing the skin, and mincing it. In this cooking video, I show you my technique for mincing a garlic clove. Most people I know use one of those hand presses, but frankly I don’t love them. First, I think it’s slower than my technique, but in addition to that, it’s another piece of equipment you have to clean. And they are not all that easy to clean either. My technique for mincing garlic uses just your chef knife and a bit of salt. Check out the video here. With a bit of practice you can get to a point where you can mince multiple cloves in just about a minute – saving time and effort. Hey I love your videos, when I'm preparing food of any sort I always try to keep my salt use to a minimum. This method seems quite heavy on the salt something I think would either disrupt the garlic flavour and create a dish that is quite unhealthy in comparison to otherwise. Would there be a way that you could suggest without the salt. Thank you for such a useful video,i usually take more time for such a process.But how easily you are doing it.I watched it many times so that i can follow it and do it easily.Mincing the garlic is it this easy.Is the salt usage makes the mincing garlic easier?